On October 28, 2003, I went to visit a dog at the Bowling Green Warren County Humane Society. They brought the three-year-old dog, Duchess, who’d been at the shelter longer than any other dog, out to play with me in a grassy area. But Duchess didn’t play. Instead, she came to sit next to me, leaning her entire body against me, in a sort of armless hug. Turned out, I had to live two more days without Duchess–which was hard, very hard, but I made it: I loaded Duchess into my car immediately after she was spayed on October 30th, when she was still woozy from anesthesia, and made the hour drive home, amazed that no one else had adopted her during her months at the shelter–I couldn’t believe my luck!–I felt like I’d won the doggie-lottery! Mark carried Duchess into the house. She immediately went to the darkest, quietest, least-used room, the dining room, and hunkered down for the rest of the night. Later, when I went to check on our six-year-old daughter, Laurel, she wasn’t in her bed. I found her curled up next to Duchess, both of them asleep on the dining room floor. After that, in return for us choosing her, Duchess chose us right back. She went everywhere we went–to visit family in Kentucky, to the beach for vacations, and to the bathroom (yes, really)–she always stayed close by, never had to be leashed, and obeyed our every command. We knew it was time to get up when we heard her tail thumping against the floor. We knew it was time for bed when grizzly-bear-worthy snoring filled our room and vibrated our bed–literally. And at all times in between, we knew she was watching over us. Duchess once leapt into the air and ate a bumble bee that had been buzzing around Laurel, scaring her, and causing her to stand frozen and crying. She stood stubbornly between me and every workman that ever came to the house. It wasn’t long before Mark recognized Duchess for what she was: the most gentle, loyal, loving, and beautiful creature on four legs. 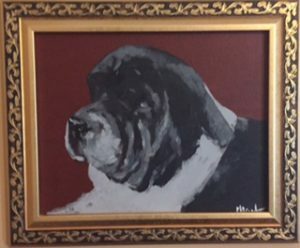 He painted a portrait of her soon after, as a Christmas gift for me. I have always cherished the painting and I cherish it even more today. The night before last was Duchess’s last night with us. As on her first night with us, she chose a place that was dark, quiet, and lonely, to rest: my closet. But, just like that first night, she soon had a friend sleeping on the floor beside her: me. I will miss her. I do miss her. Painfully. (Did you know that it’s possible to cry so much that your eyes get chapped? Well, it is. Apparently.) But more than that, I am so grateful for the life of Duchess, so glad we found her, so glad she got to be our dog, and we got to be her people. In other words, I still think we won the doggie-lottery. No, I KNOW we did.